Another interesting race day at Concept Haulers for race number 2. We had a quick breakfast at the Greenwood and headed off to the track. We had previously planned to play baseball on Saturday and then race at Badger on Sunday using the Briggs Animal but all of that was canceled, due to wet fields. The weather was, of course, wacky. It even snowed briefly during set up and again during the first kid kart practice. Soon it was our turn to hit the track. 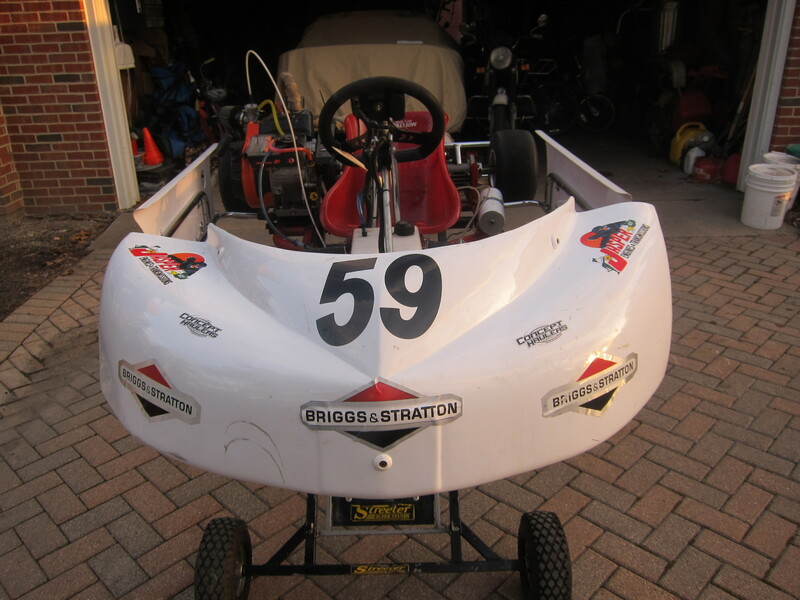 Last year CHMS started the Briggs LO206 senior for 15+ year olds. 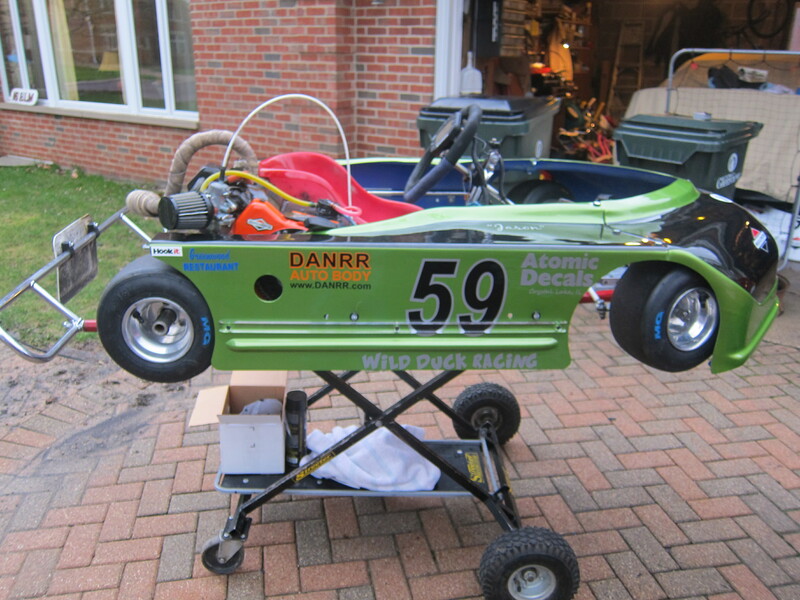 Open chassis, open body, sealed motor, if the rules say it is allowed, then it is allowed. Otherwise it’s not, and you can’t do it. 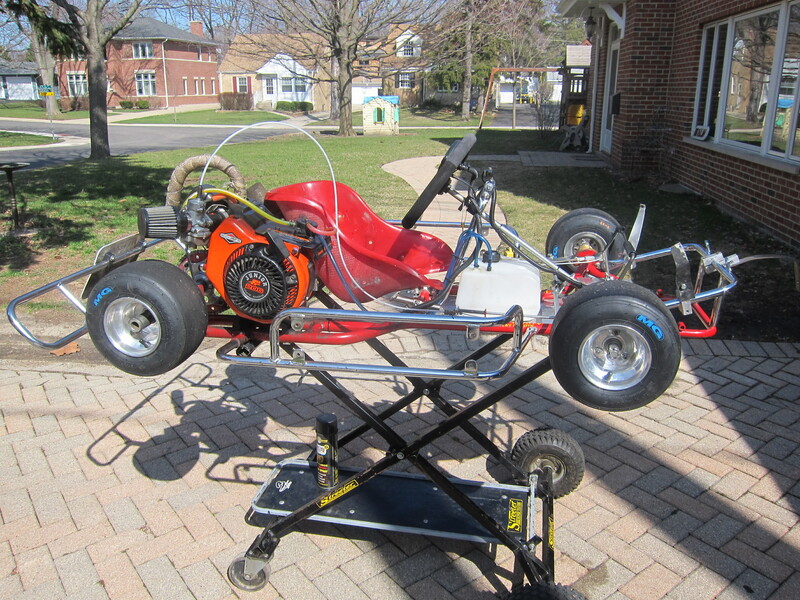 This keeps costs down and the focus on the on kart setup and driving. 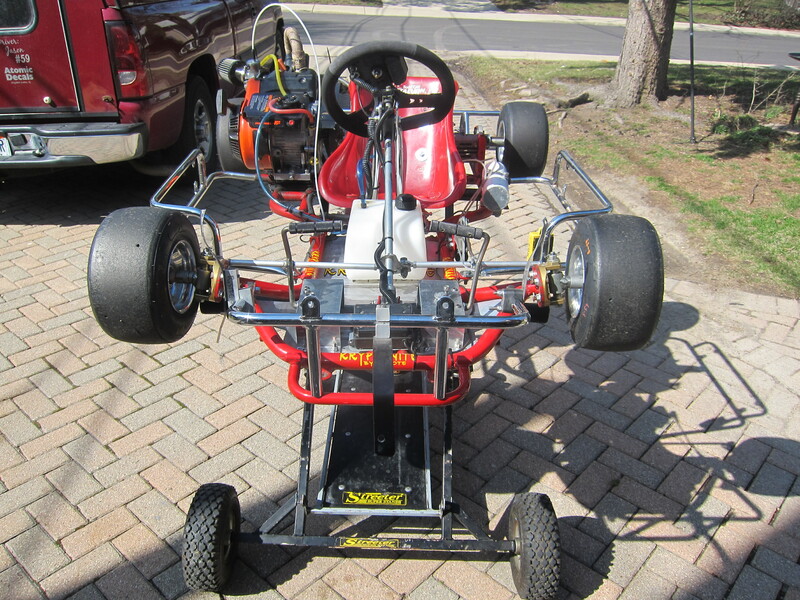 The LO206 Jr 1 (Sportsman) is usually limited to 7 to 12 year olds, and LO206 Jr 2 (Junior) for ages 12-15. 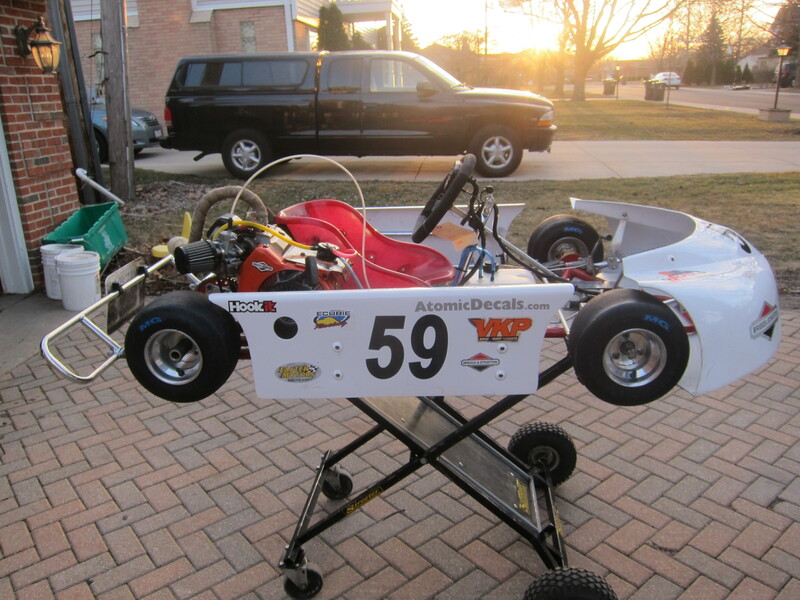 Concept Haulers does not yet have a Junior class so one 14 yr old (Brandon) has joined the younger kids. 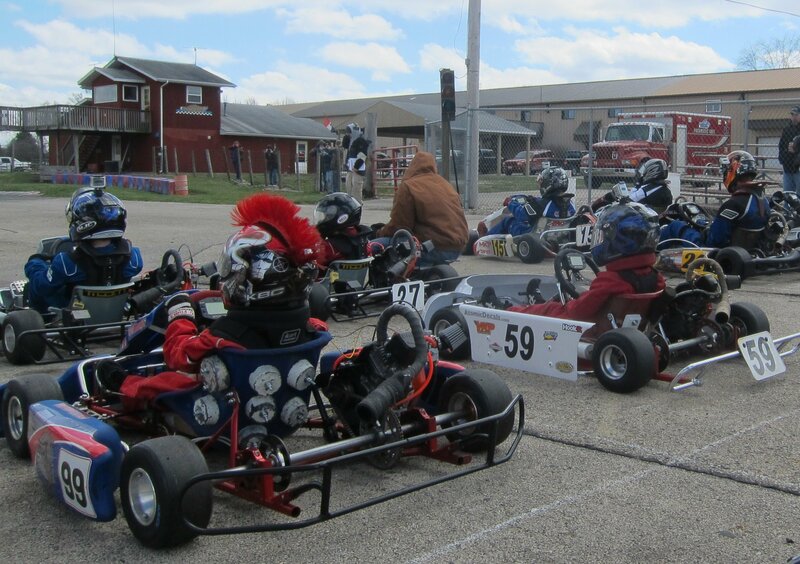 The younger kids are either just out of kid karts or have never raced karts before. Brandon has raced for 3 years in the Yamaha classes and should have some interesting things to show us. There are now 5 racers in the class with 1 or 2 more still out there but not yet ready. The first session was the usual except for Brandon. He spent most of his time in a spin while he broke in new tires on a cold track. For the 2nd and 3rd sessions Brandon flew around the track. He was running laps close to 60 seconds. Jason and the other boys were running upwards of 65 seconds. We now had someone to show us the way. The only real problem we had was that our MyChron computer’s battery died and we were not able to find a good one. This only meant that we did not have any data to study after the races. Heat 1 started Brandon on the pole and Jason in second, followed by Chad in 3rd, Logan in 4th and Kyle bringing up the rear. 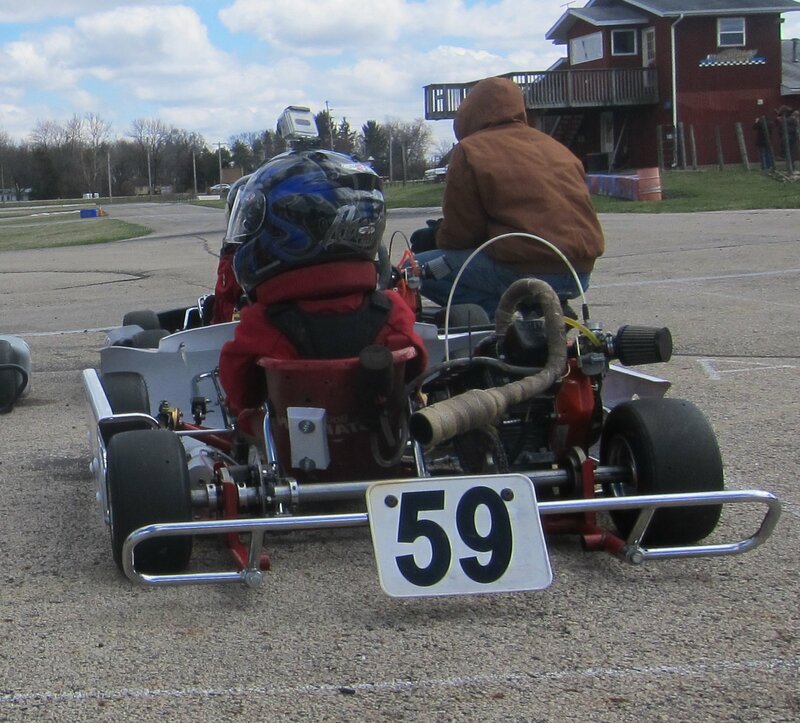 Kyle’s kart pooped out on the first parade lap so they went for another and picked him up at the kid kart cut off. When the green dropped, Brandon shot off into the lead with a really great start. Jason kept the second spot followed by Chad, Logan, and Kyle. On the second or third lap Brandon’s chain fell off and he dropped out. Jason was now in the lead. The green flag waved for the second to last lap. Jason caught up to Logan in the back stretch but hesitated passing him and got passed by Chad and Kyle. He got by Logan in the monza but the other two were far ahead. Jason managed to regain his composure and catch up to them by the hair pin and chased them to the white flag. Try as he might he couldn’t overtake them in the final lap. As they exited the last corner Chad, still in the lead, spun and drove off the road into the infield. Kyle and Jason zipped by him for first and second respectively. The starting order was reversed for Heat 2. Jason started fourth. He was a little slow at the start and was waylaid by Logan as Brandon slipped by them both. Jason passed Logan in the first corner and is fourth. By the time they hit the hairpin it’s Brandon, Chad, Kyle, Jason, followed a ways back by Logan. The rest of the race is a battle between Chad and Kyle for second. Jason is not making good time, his line is not quite right, as the 1, 2 and 3 pull away. They finish Brandon, Kyle, Chad, Jason, then Logan. He was disappointed but kept his chin up and went to play with his friend before the feature. The Feature positions are determined by the heat finishes. Kyle is on the pole, Chad 2nd, Brandon 3rd, Jason 4th, with Logan in the 5th spot. At the start Jason stays in 4th and Brandon jumps past Kyle into turn one and starts his attack on Chad. Suddenly, Chad spins in the middle of turn turn two. Thankfully, everyone pass by him safely as he tries to recover. Jason is hounding Kyle for the first 2 laps. In turn 14 of lap 2 Kyle turns too sharp and slides, losing momentum and Jason gets by. Kyle tries to get by Jason all the way to the last lap when Kyle spins out in the hair pin and passed is by Chad. Jason runs clean. while he is lapped by Brandon and then leads the rest of them home and takes second place. A good end to the day. I was very proud of Jason today. He kept his cool when he was not doing well. He was pretty happy to just to race. 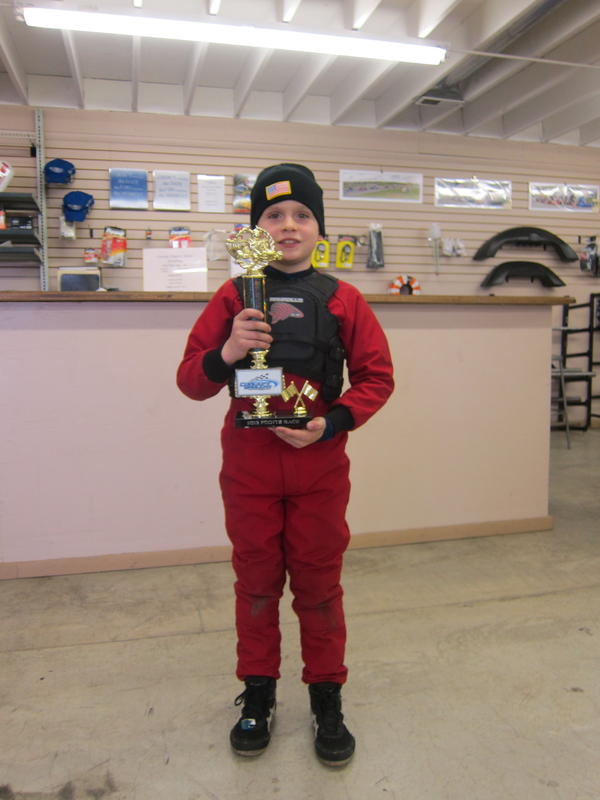 He was very excited to place second in the feature only being beaten by a more experience driver. 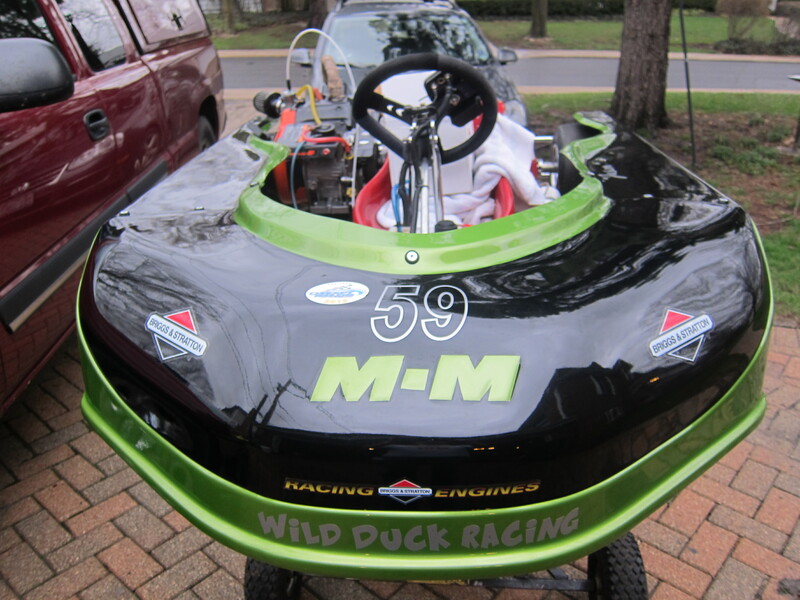 We both have lots of work to do for the next race. 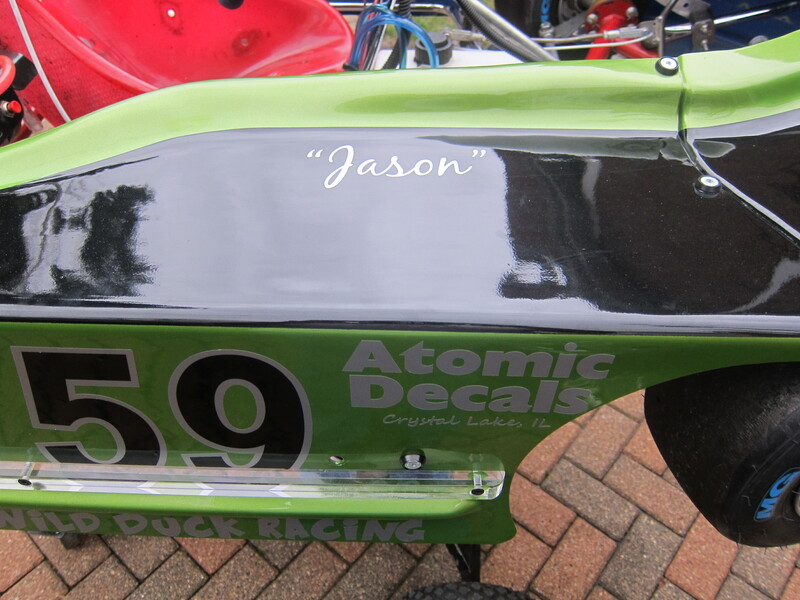 Jason needs to watch some video and try to find the racing line and hopefully play some baseball too. Watching Brandon should eventually help Jason and the rest of the boys get faster laps. 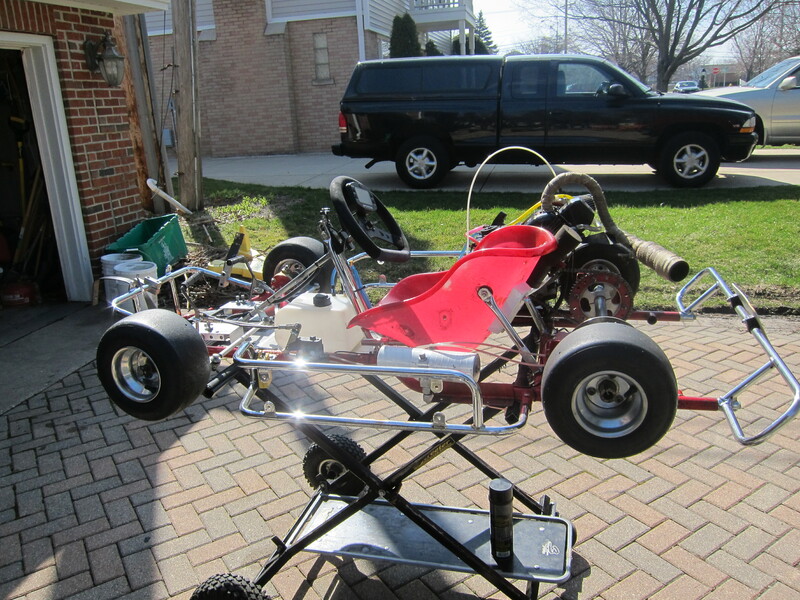 I need to put the new body on the kart. 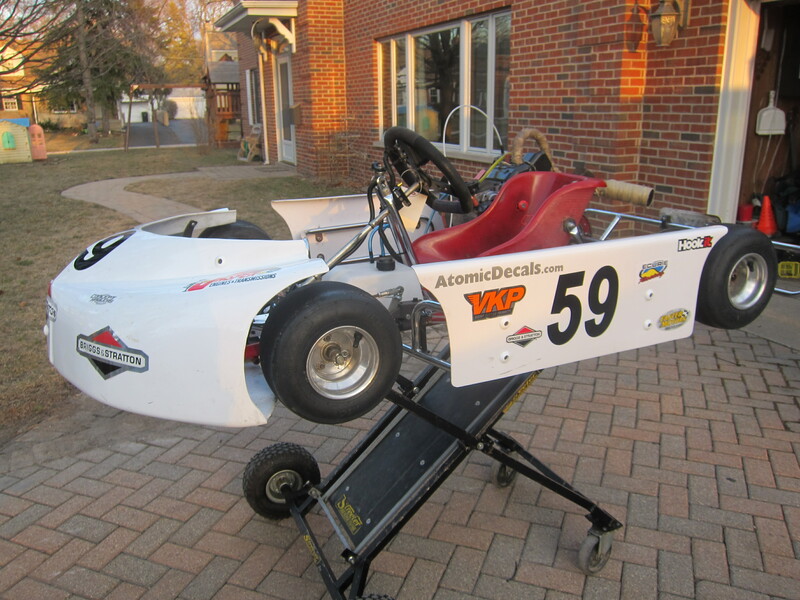 This will give a few weeks to shake down the kart again as we get ready for the first CES race weekend at Gateway Motorsport Park in St Louis. 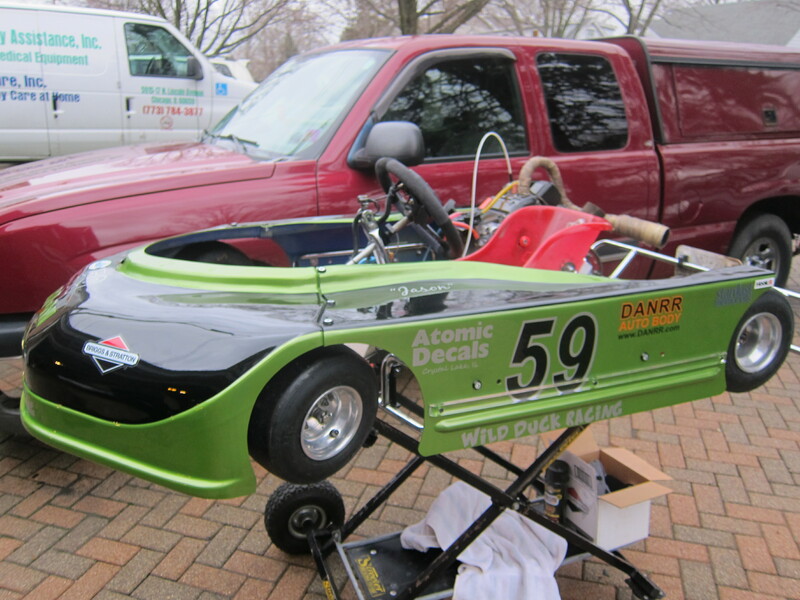 Thanks to Danrr Autobody for the really cool paint and Atomic Decals for the stickers. Thanks to Brad and Brandon for letting us pick their brains and showing us the way. It was great to see some Badger friends who came down, due to their track still being closed. My wife for reminding me that Bacon Fest is on the 27th after the race, so we are going to need to fly out of there when where are done.